CLEVELAND — Not a coaching change. Not new players. Not any MAC team has been able to slow this historic run. Jeremy Harris scored 31 points, C.J. Massinburg added 17 and No. 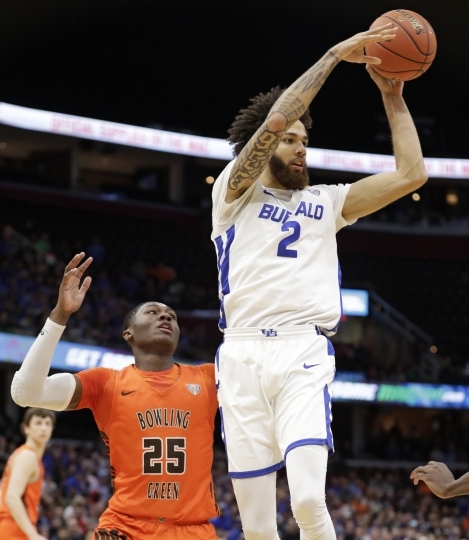 18 Buffalo won its fourth Mid-American Conference title in five years — and further stamped itself as a team capable of doing major damage in March — by beating Bowling Green 87-73 on Saturday night. 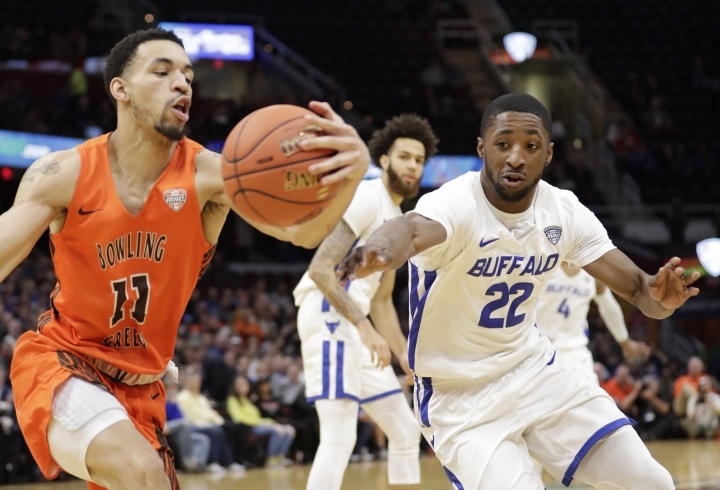 The top-seeded Bulls (31-3), who dominated the MAC during the regular season, withstood a strong effort by the Falcons (22-12), one of three schools to beat them during the regular season. 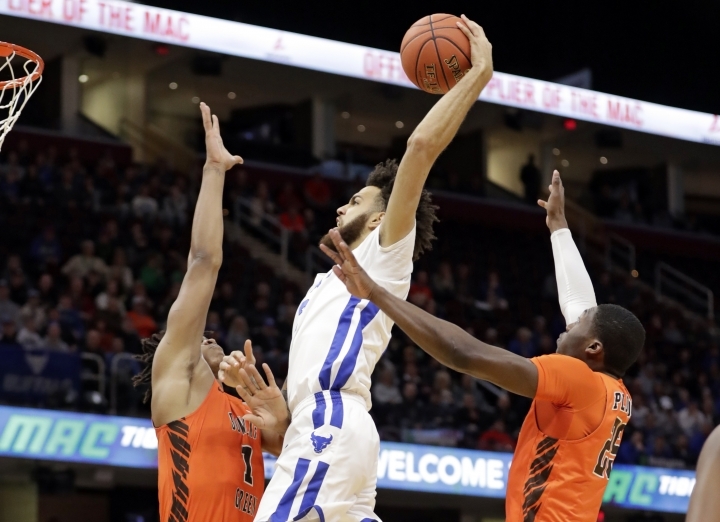 Buffalo's five-year reign atop the league is unprecedented for the MAC, and the latest title only boosts a resume that should make the Bulls the highest ever seeded MAC team when the NCAA brackets are unveiled Sunday. "It goes to show what a dynasty this program is," said Massinburg, the MAC's Player of the Year. "We're going to be good for years to come. This team is not done yet. It's going to be scary." 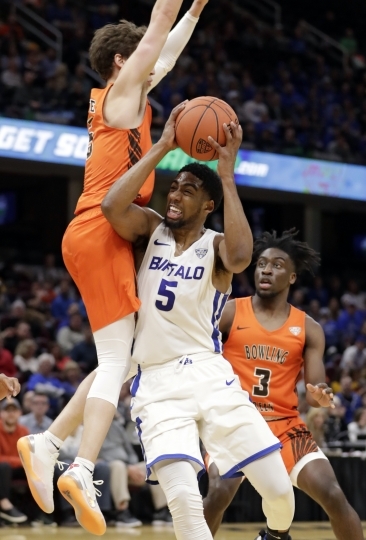 Bowling Green gave Buffalo all it could handle and it was within 74-71 after Bulls center Nick Perkins fouled out with 4:26 left when he was called for a technical foul. 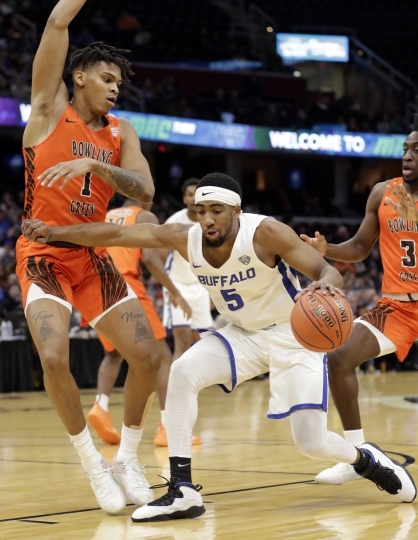 But Buffalo scored 12 straight points and closed with a 14-3 run to complete a three-day sweep at Quicken Loans Arena, a friendly home away from home for the past few years. 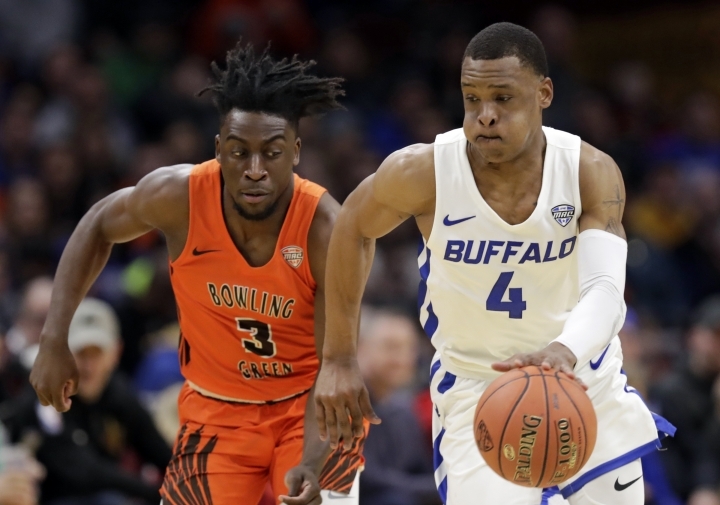 Buffalo's program has been on the rise for years, and has stayed strong despite coach Bobby Hurley's departure and playing a league known for its competitiveness and balance. The MAC, though, belongs to Buffalo right now. The Bulls shocked No. 4 seed Arizona in last year's NCAA Tournament and are looking to go further in 2019. "We want to make it to the second weekend," said coach Nate Oats. "This team is pretty special." Harris, a silky smooth left-hander, went 13 of 20 and was named the tournament's MVP. He opened the night with a thunderous dunk and had several jaw-dropping baskets. "Jeremy was cooking. That man over there," Massinburg said, looking at his teammate. "He's something different." 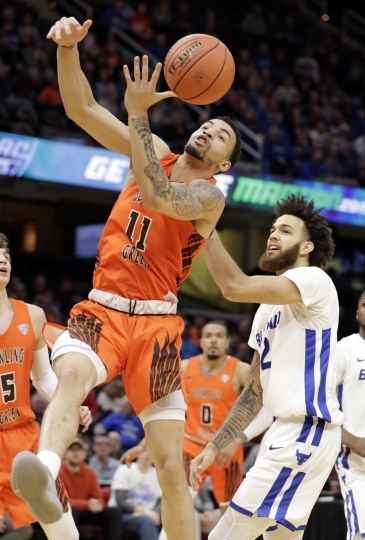 Justin Turner and Daeqwon Plowden led Bowling Green with 16 points apiece. The Falcons stayed close by winning the rebound battle 48-34, but didn't have enough to earn their first NCAA bid since 1968. Maybe next year. This one belongs to Buffalo — again. "They get all the credit," said Bowling Green coach Michael Huger. "They made the plays. Harris made the shots that he needed to make. Graves made the shots that he needed to make. We took away things that they wanted to do with mainly Perkins and containing Massinburg, and those other guys stepped up. That's what really good teams do." 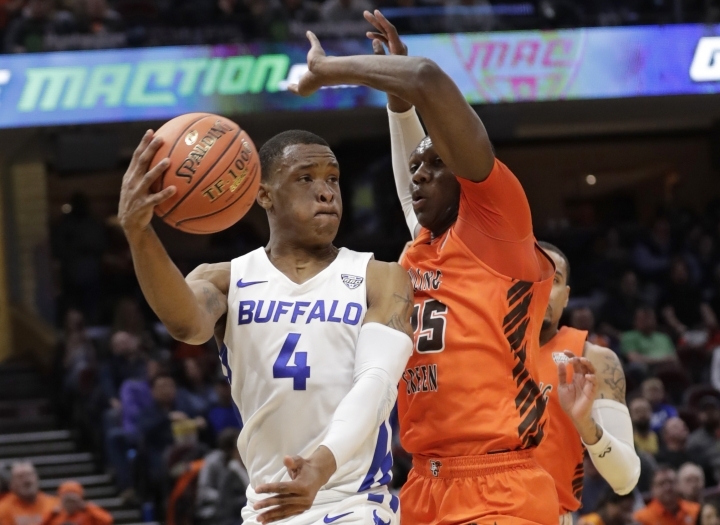 Buffalo came in with an NCAA bid locked up, and while the Bulls' dominance helps the MAC's national reputation, it will prevent the league from getting two teams in the NCAA Tournament. The MAC hasn't had two schools in the 64-team field since 1999. 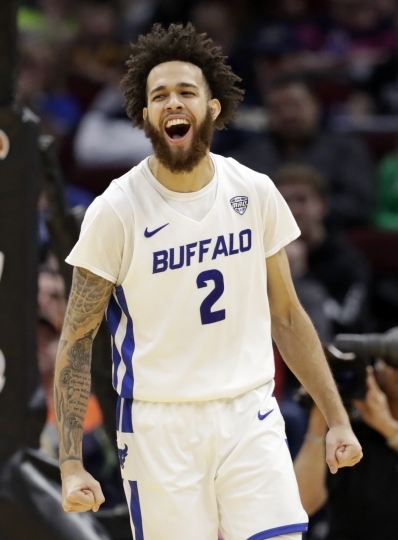 Oates said the NCAA Committee needs to recognize Buffalo's accomplishments. "We won 31 games. I think we deserve a 4 (seed)," he said. "A minimum of a 5. I don't know why not." The MAC has not had a team seeded eighth or higher since the Tournament expanded to 64 in 1985. Bowling Green: Played in just its fourth MAC title game and first since 2002. Also made the final in 1983 and 1980. ... Won at least 22 games for just the fourth time since 1950. ... Huger likes what's ahead for his program. Bowling Green was picked to finish last in the MAC East before the season. "The future's bright for Bowling Green basketball," he said. "We've got to work to get back to this point. The guys are hungry. They see what it's like out there. Definitely a motivational thing of seeing it tonight and wanting more." Buffalo: Won its 12th straight game. The win completed a championship sweep by the school as the women's team won the MAC title earlier in the day. ... Racked up school records for wins, conference wins and went 14-0 at home, where they've won 26 straight. ... Entered as one of three schools with 30 wins. Houston and Gonzaga are the others. Bowling Green: In position for a postseason bid. 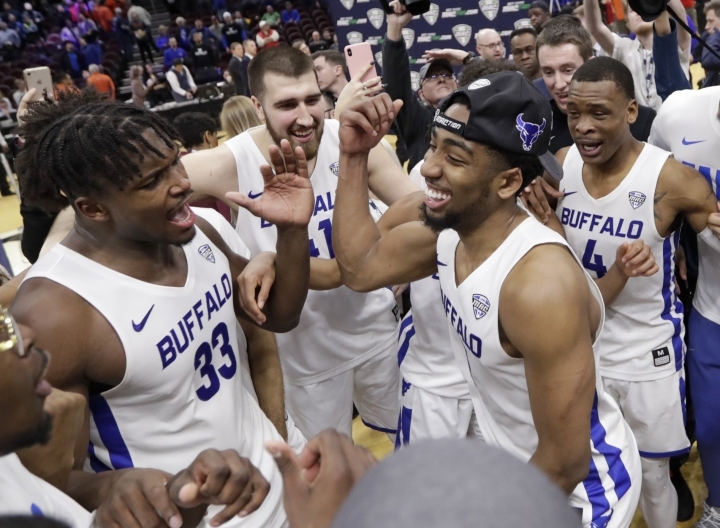 Buffalo: Waits for Sunday's selection show and potentially as high as a No. 6 seed.